"YOU MIGHT BE THE KILLER: Join us as we wrap up Toronto After Dark 2018 with our Closing Gala, YOU MIGHT BE THE KILLER, one of the smartest and funniest horror films you will see this year! 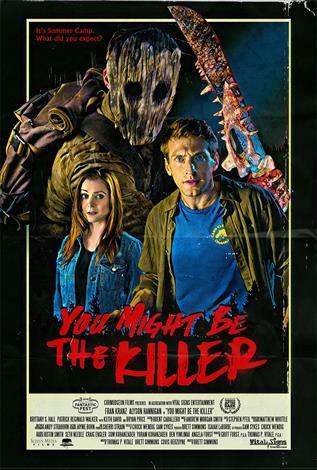 In the middle of the night, a remote summer camp counselor Sam (CABIN IN THE WOODS' Fran Kranz) calls up Chuck (Alyson Hannigan of BUFFY and AMERICAN PIE fame), his best friend back home, in a blind panic! He's surrounded by brutally killed fellow counselors and worried there's an axe-wielding psychopath on the loose, now fears for his life! Luckily Chuck's well-versed in slasher movie tropes and she leads Sam through all the necessary steps to survive the night, at the same time as they try to identify the actual killer. With great banter between two delightful leads, a brutal killer in the woods, and lots of clever twists, YOU MIGHT BE THE KILLER is a horror fan's delight not to be missed! CHECK OUT THE REST OF THE FEST & SAVE: This is just one of 20 thrilling screenings at this year's Toronto After Dark: Horror, Sci-Fi & Action Film Fest, Oct 11-19, 2018 at Scotiabank Theatre Toronto. Regular Tix $13.50. Save when you buy Multipack Tix (Two or More Different Screenings) just $11.50 each! To get the Multipack price, purchase tickets to more than one festival movie screening in the same order Online or using the Cineplex App. FOR MORE INFO: Including complete Toronto After Dark Film Fest schedule, film info, trailers as well as terms and conditions visit: www.torontoafterdark.com Note: Festival Screenings, with few exceptions, restricted, Adults 18+ Any Questions Please Email: tickets@torontoafterdark.com"